A. 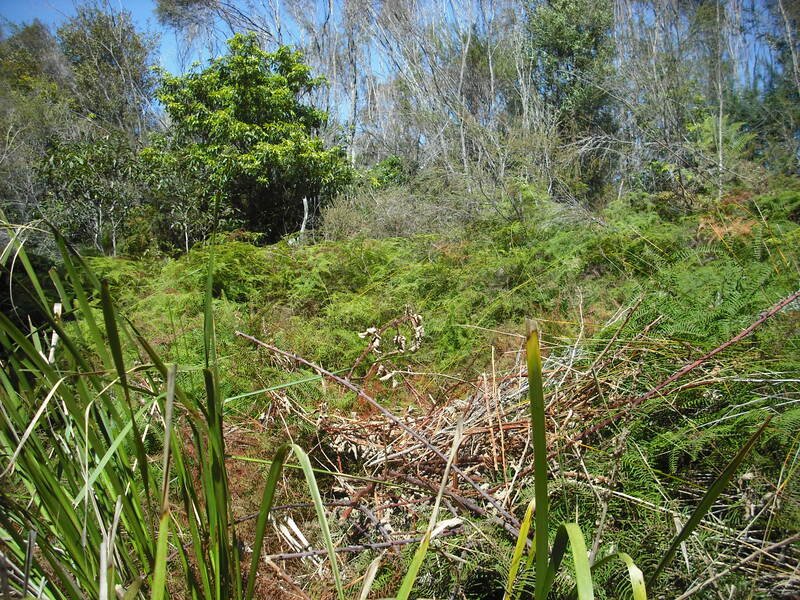 Disturbed plant communities – “Modified Bushland”. Some of the natural native plant communities along the upper reaches of Lawson Creek have been disrupted by weeds or infrastructure development such as pipe and power line construction. In these communities weeds such as Privet, Blackberry and Japanese Honeysuckle dominate or intermingle with individual and small stands of mixed native species. B. Intact and relatively undisturbed native plant communities. They are located along the middle and lower reaches of Lawson Creek and extend towards the south of the site and the National Park. There are four indigenous and relatively undisturbed vegetation communities present at the South Lawson Park bushcare site. 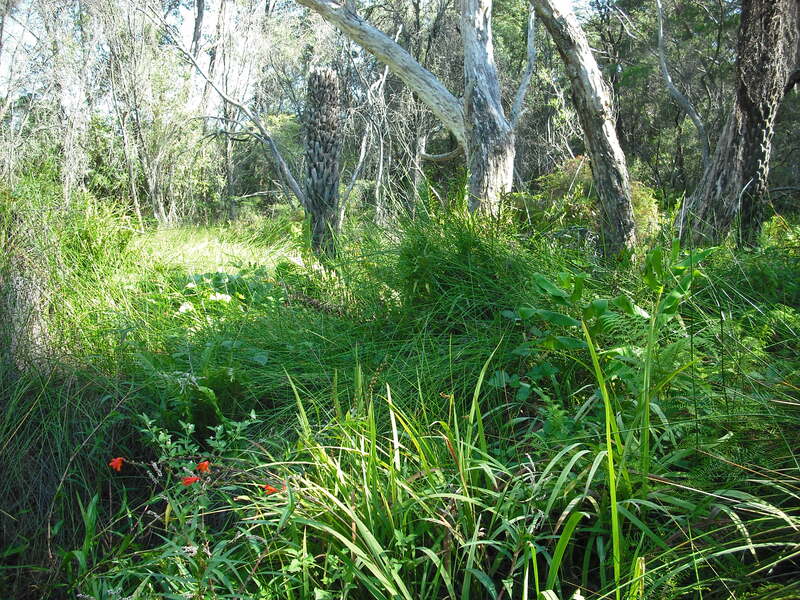 (To view the locations of each of these plant communities go to BMCC Interactive Maps: http://emapping.bmcc.nsw.gov.au/connect/analyst/mobile/?mapcfg=Locality#/main?mapcfg=Locality Search: South Lawson Park; Menu: Vegetation community). B. Corymba gummifera (Red Bloodwood) – Eucalyptus sieberi (Black or Silvertop Ash). These types of woodlands are the most extensive form of vegetation present on the site and the forest trees of these two communities have evolved to grow on sandstone based soils that are of average to low fertility and very well drained. 2. 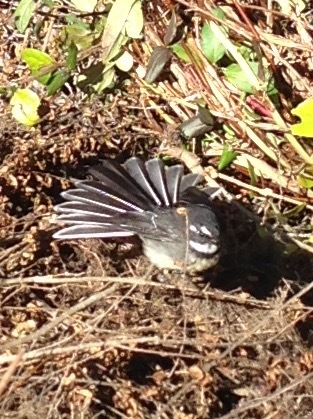 Blue Mountains Riparian Complex. Sections of the Lawson Creek bank have richer than average soils due to a high content of deposited alluviums. They support moisture loving plants such as ferns, gahnias and the tree species Black Wattle, as well as eucalypyts, banksias, hakeas, acacias and tea-trees, sometimes in dense groves. 3. Blue Mountains Swamps. The sedges, ferns and shrubs of the swamps grow in peaty soils that contain large amounts of vegetative matter and are located in permanently damp situations. 4. Rainforest. The small patches of valley floor rainforest are dominated by the tall tree Coachwood (Ceratopetalum apetalum) and Sassafras (Doryphora sassafras) is also present. Todea barbara (King Fern), is prominent. The rainforest plant community enjoys the richer soils of the Lawson and Cataract Creek banks. Note: The State and Commonwealth listed Vulnerable shrub species Persoonia acerosa (Needle Geebung) and the endemic species Acacia ptychoclada, a wattle, have been recorded on the site. An excellent reference book for Blue Mountains flora is “Native Plants of the Blue Mountains”, by Margaret Baker and Robyn Corringham, Three Sisters Publications. Available at local bookshops. It’s very reasonably priced and has great illustrations and lots of information about the local natural environment. A great way to become familiar with the flora and weeds of the Lawson Creek catchment is to view our eight minute film, Bushcare Blue Mountains: South Lawson Park: https://vimeo.com/verahong/south-lawson-bushcare . Many thanks to Vera and Craig at Seconds Minutes Hours Productions for their wonderful cinematography. 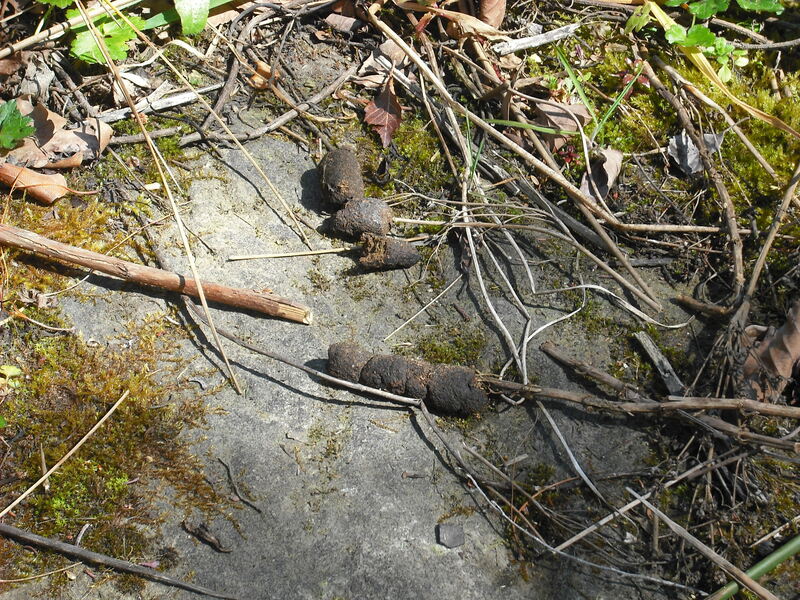 Approximately 100 indigenous fauna species have been recorded on the site. 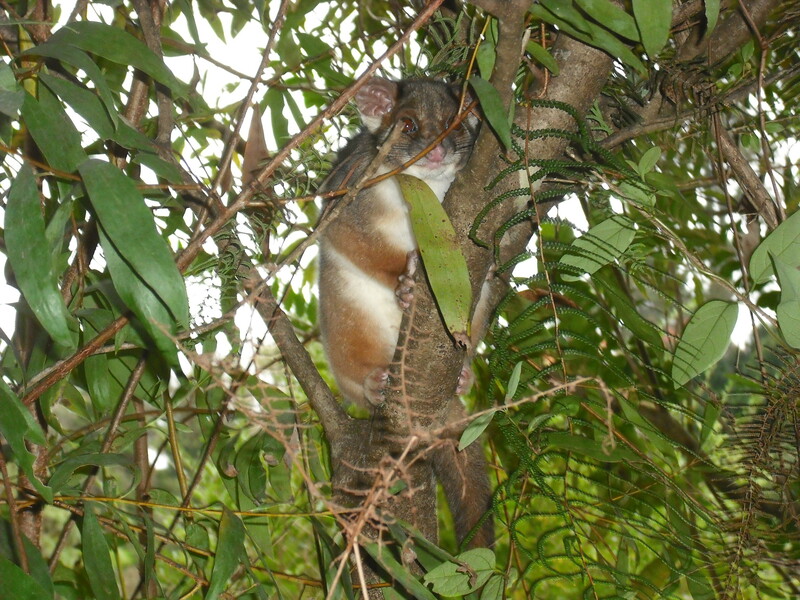 The list includes terrestrial species such as birds and marsupials and also stream (Lawson Creek) and groundwater (Lawson Creek Swamp) dwelling species. results from the Stygofauna Monitoring Project 2011-2013 (See: Archives / Stygofauna Monitoring Project 2011). Note: * = introduced species. Crinia signifera Common Eastern Froglet (frequent, heard Lawson mid-swamp, 2009-2018; FS 2018). (North Lawson swamp, 2016, photo). The purpose of bushcare is to contribute to the healthy functioning and preservation of the naturally evolved bushlands and ecosystems of a region. 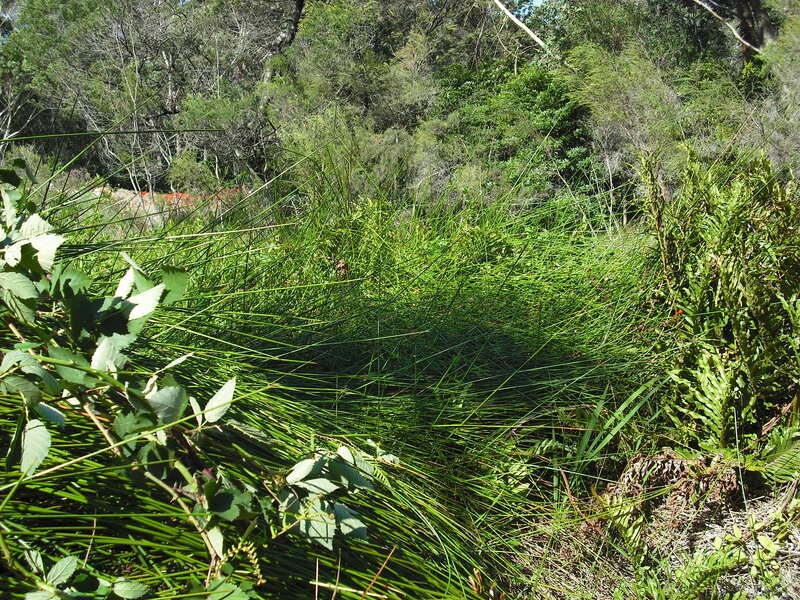 For the purposes of bushcare, a weed is considered to be a plant that is growing in or is likely to spread into but is not a naturally evolved species of the local and regional bushland and ecosystems. A weed can be an overseas species, or an Australian native species that has commenced growing in an ecosystem to which it does not naturally belong. Some, but not all, introduced plants, in the absence of the natural control factors of their original ecosystem, grow and spread so vigorously that they overwhelm and replace many of the locally and regionally evolved plants that constitute the local ecosystem, significantly altering and even destroying the functioning of that ecosystem. This type of weed may be declared a “Priority Weed” or a “Weed of Regional Concern” under the NSW Biosecurity Act 2015. 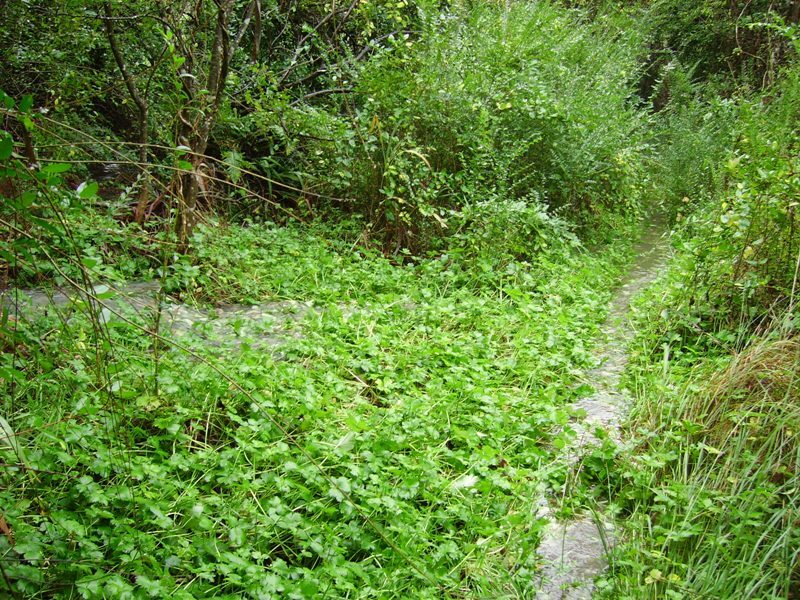 Public authorities and private landowners are required to manage this declared weed in a specified way. This listing of site weeds is not meant to be exhaustive. Smaller quantities of Cootamundra Wattle, Himalayan Honeysuckle, Butterfly Bush (Buddleia davidii), and Turkey Rhubarb are present and under varying degrees of control. Weedy grasses are also present and undesirable and are treated when encountered. Best of all, visit one of the two local provenance native nurseries in the Blue Mountains and buy their plants: Wild Plant Rescue, Katoomba, and the Conservation Society Plant Nursery.